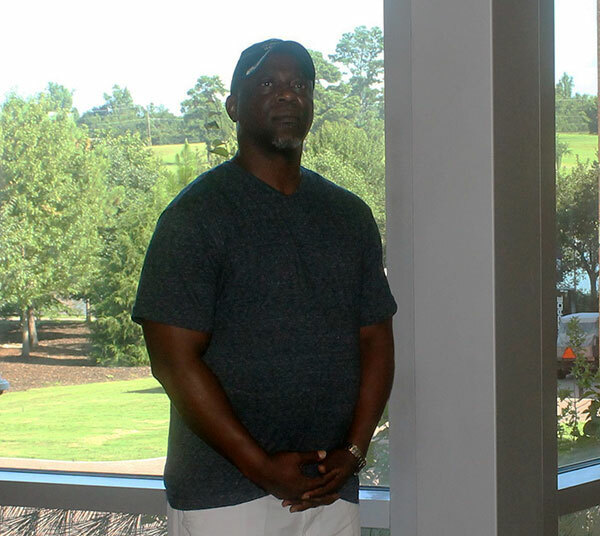 Air Force veteran Charles Williams, now pursuing his master's degree in IT from Middle Georgia State, is a charter member of the Graduate Studies Advisory Council. Full Name: Charles Moses Williams, Jr.
Family: Terri (wife), Chase (son – Georgia State graduate – 2014), Chantz (son – Savannah State student – pending graduation in 2018). Employment/Career: "I am a full-time student at Middle Georgia State University." Degree Objective: Master of Science in Information Technology with emphasis in Information Security and Digital Forensics. Activities: Former president of Middle Georgia State's Student Veterans Association (SVA); current member of the Graduate Studies Advisory Council. Career Goals: "Completing this program meets employment prerequisites, as well as my ambition, to join the Middle Georgia State’s IT department as a professor." He chose Middle Georgia State University because … "Retiring from the Air Force after 23 years of active service, and after three and a half years working as a contractor in the Middle East, I was afforded an opportunity to fulfill a lifelong objective - graduate from college. I haven’t been in the classroom in quite some time and wanted to attend an institution that offered the degree I planned to pursue, Information Technology, with face-to-face courses, not just online. Middle Georgia State University met both requirements. The Information Technology department’s faculty and staff were instrumental in translating transcripts from two educational institutions, University of Maryland College and University of Central Florida, and my military educational transcripts while guiding my curriculum to graduate with my bachelor's degree with concentrations in Networking and Information Assurance. I'm now pursuing the IT master's degree." The greatest thing he discovered about Middle Georgia State was … "It was not until attending Middle Georgia State that I found its true gems - the professors in the IT department. My instructors were sincere in assisting students in any way they could to help them succeed at their educational goals. I witnessed those professors during my education use various methodologies to reach a student. For instance, a primary instructor appealed to another faculty member, one that had a good rapport with a troubled student, for help mentor that particular student. Most impressive is how approachable my professors are in helping me find my way. They have reinforced my passion to join the fight and become an instructor, but until then, I find joy in helping my fellow classmates." His greatest academic experience so far as a Middle Georgia State student has been … "One of my best experiences thus far happened over a summer Biology course. Before my first exam, I arrived 90 minutes early to give myself time for a review before testing. While doing my review I saw other students performing the same ritual and broke the silence by asking questions about the material. After the exam, three of us saw the benefit in our pre-examination discussion, so I suggested we meet again before the next exam and discuss material. Little did I know that some students in our class overheard this conversation and showed up before the next exam to join our group. By the third exam, this group grew, through word of mouth, from a few students to more than 65 percent of the class. My professor, Dr. Dawn Sherry, applauded me for my efforts in helping others pass this course." To him, “greatness” means … "A measure of someone. Evaluating greatness takes place on many levels. Greatness is consistent with giving everything your best effort. Greatness shows no prejudice of race, of station, or of accomplishments. It shows humility in all facets of life. Greatness in action is a professor who takes pride in the success of students yet goes quietly about the business of helping those that fall behind. I have noticed this characteristic in some of my own MGA professors. Former students are more than happy to boast about these individuals and the positive affects they have had to help achieve a life goal. I see this as greatness, which helps explain my passion to become a professor." In five years … "The opportunity to teach at Middle Georgia State University is my personal and professional desire. In five years I envision myself in an IT classroom helping those seeking a career in IT to achieve this goal. As an Air Force Veteran of 23 years with field experience in Information Technology, I found real joy in training my subordinates, which kept me moving forward. I would like to continue in that capacity of helping to develop IT professionals. Middle Georgia State offers the opportunity to fulfill my personal ambitions."